The movement of contaminants into these aquifers, if it occurred, would be extremely slow (DOE, 1997, Waste Isolation Pilot Plant Disposal Phase Final Supplemental Environmental Impact Statement, DOE/EIS-0026-S-2). Five community supplies of drinking water (representing three major regional aquifers) are included in routine sampling, including Carlsbad, Loving/Malaga, Otis, Hobbs, and a secondary source for Carlsbad. One private water well (representing a fourth aquifer) that is located within ten miles of the WIPP is also sampled because it is the only private well in close proximity to the WIPP that is known to have been used for human consumption in recent years, and because it draws from the aquifer considered most likely to be contaminated by releases from the WIPP into ground water, (DOE, 1990, Final Supplemental Environmental Impact Statement, DOE/EIS-0026-FS). Studies of the drinking water sources utilize samples collected at locations in the drinking water systems that are considered to be representative of the overall supply to the system’s user group. Many of the systems draw from several wells simultaneously or on a rotating basis, and routinely sampling all of the dozens of individual wells is not justified. Instead, samples for municipal systems are drawn from the primary reservoir vessels downstream of the well sources, which are more representative of the overall water supply than samples from individual wells. Likewise, for municipal supplies, samples are not taken from individual user taps because of the potential contamination introduced via the residential segments of the system, which would have no demonstrable relationship to contaminants from the WIPP. Recharge of the target aquifers is not known to be strongly linked to seasonal cycles (except in a few cases where an indirect linkage via hydraulic head pressure is suspected). Therefore, there is little basis to expect any significant seasonality in drinking water contaminants of concern, and the WIPP EM sampling design for drinking water does not incorporate a seasonal component. During initial baseline studies in 1996-1998, the drinking water samples were subjected to a suite of analyses for over 150 analytes, including those that are regulated under the Safe Drinking Water Act, and contaminants known or suspected to be present in the WIPP wastes. In addition to serving as a baseline for future comparisons, these analyses provided information that was considered to be of general interest to the public. Knowledge of the basic chemical composition of the water supplies is also useful in radioanalytical studies, where chemical processes can be strongly affected by non-radioactive components. 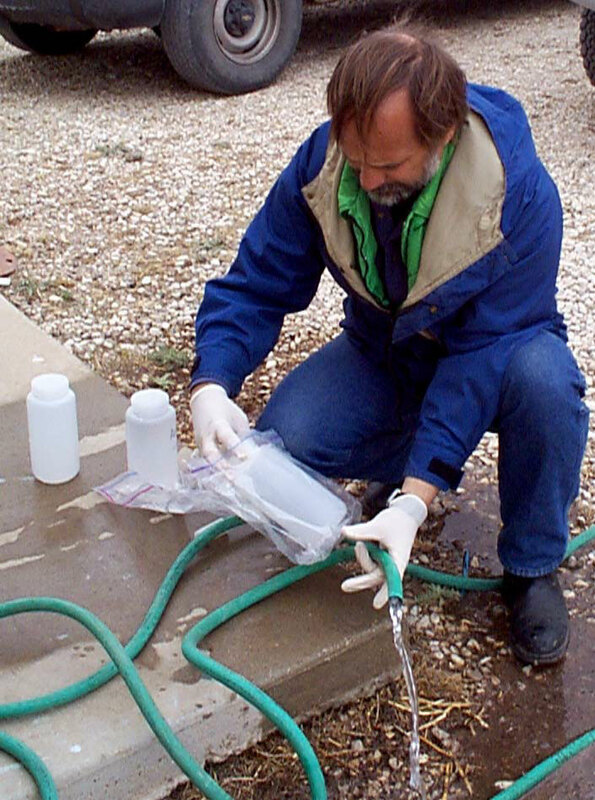 In relation to the core objectives of the WIPP EM, radioanalyses of drinking water conducted during 1997-1998 were unable to detect Pu or Am in any of the samples collected. The analyses applied to the samples consisted of traditional alpha spectrometry. Samples of drinking water were also submitted for thermal ionization mass spectrometry (TIMS) (a more sensitive radioanalytical technique). The TIMS analyses did not detect any of the manmade actinides of interest. Each of the six drinking water supplies are now sampled once annually for selected radiological and inorganic testing.